本发明公开了一种页面中的图片呈现方法及设备，包括步骤：将页面划分为多个区块并注册；对各区块中需要延时呈现的图片进行注册；在浏览器中下载所述页面中未注册的图片；判断注册的区块是否要呈现，如果要呈现，则在浏览器中下载注册的区块中需要延时呈现的注册的图片；以及呈现所下载的位于浏览器的当前窗口中的图片。 The present invention discloses a page image rendering apparatus and method, comprising the steps of: a page is divided into a plurality of blocks and registered; block delay is needed for each image presented to register; download the page in a browser not registered images; determine whether registration of the block to be presented, if you want to appear, then download the required delay block registration of registered images rendered in the browser; and rendering the downloaded in the browser's current window pictures. 由于浏览器会把网络资源分配给下载需要呈现的图片，从而能够合理运用网络资源，提高页面的加载速度。 Because the need to download the browser will render the images to a network resource allocation to enable rational use of network resources, improve the loading speed of the page. 本发明涉及计算机技术领域，具体涉及一种页面中的图片呈现方法及设备。  The present invention relates to computer technologies, and particularly, to a page image rendering method and apparatus. 随着互联网的快速发展，网站页面使用越来越多的多媒体资源来丰富页面的显示效果，以吸引用户浏览。  With the rapid development of the Internet, Web page using more and more resources to enrich the multimedia display page to attract users to browse. 然而，在加载页面的过程中，会下载页面中所有的图片，即使不在页面可见区域以内的图片也会下载。  However, in the process of loading the page, the page will download all the pictures, even if not within the visible area of ​​the page images will be downloaded. 由于在用户处的网络资源有限，会因为需要下载页面中所有的图片而降低页面的加载速度，从而影响用户体验。 Due to the limited network resources at the user, because of the need to download all the pictures page and reduce the page loading speed, thus affecting the user experience. 鉴于上述问题，提出了本发明以便提供一种克服上述问题或者至少部分地解决上述问题的页面中的图片呈现方法及设备。  In view of the above problems, the present invention is proposed in order to overcome the above problems or to provide an at least partially solve the problems in a page image rendering method and apparatus. 根据本发明的一个方面，提供了一种页面中的图片呈现方法，包括步骤:将页面划分为多个区块并注册;对各区块中需要延时呈现的图片进行注册;在浏览器中下载页面中未注册的图片;判断注册的区块是否要呈现，如果要呈现，则在浏览器中下载注册的区块中需要延时呈现的注册的图片；以及呈现所下载的位于浏览器的当前窗口中的图片。  In accordance with one aspect of the present invention, there is provided a page image presentation method, comprising the steps of: a page is divided into a plurality of blocks and registered; block delay is needed for each image presented to register; browse is not registered in the download page picture; judging whether the registered blocks to be rendered, if you want to appear, then in the browser to download the registration block delay registration required picture presentation; and presenting downloaded to a browser the current window is in the picture. 可选地，对各区块中需要延时呈现的图片进行注册的步骤包括:将需要延时呈现的图片的地址信息嵌入到图片标签的自定义标签属性中。 Step  Alternatively, the delay required for each block of the image presented to register comprises: a delay is needed rendered image of the address information is embedded in image custom label tag attributes. 可选地，判断注册的区块是否要呈现的步骤包括:判断注册的区块是否位于浏览器的当前窗口中。  Optionally, the step to determine whether the registration of the block to be presented include: determining whether the registration block in the current browser window. 可选地，判断注册的区块是否需要呈现的步骤包括：判断注册的区块是否在浏览器的窗口中移动。  Alternatively, the step of determining whether the registered block need to be rendered comprising: determining whether the registered block is moved in the browser window. 可选地，还包括步骤：当浏览器的当前窗口中呈现的内容发生变化时，判断注册的区块是否要呈现，如果要呈现，则下载注册的区块中需要延时呈现的注册的图片。  Optionally, further comprising the step of: when the contents of the current window of the browser changes presented to determine whether registration of the block to be presented, if you want to render, block the download registration required delay in presentation Sign up pictures. 可选地，下载注册的区块中需要延时呈现的注册图片包括步骤:将图片的地址信息从图片标签的自定义标签属性复制到图片标签的源地址属性中，以便浏览器可以根据图片标签的内容去下载所述图片。  Alternatively, block download registration required delay in presenting the picture includes registration steps: Copy the picture of address information from the custom label attribute of the image tag to the source address attribute of the image tag so that the browser can according to the contents of the image tag to download the picture. 根据本发明的另一个方面，提供了一种页面中的图片呈现设备，包括：区块划分器，被配置为将页面划分为多个区块；区块注册器，被配置为对各区块进行注册，并对各区块中需要延时呈现的图片进行注册；图片渲染器，被配置为在浏览器中下载页面中未注册的图片；区块呈现判定器，被配置为判断注册的区块是否要呈现，如果要呈现，则由图片渲染器在浏览器中下载注册的区块中需要延时呈现的注册的图片；以及图片呈现器，被配置为呈现由图片渲染器所下载的、位于浏览器的当前窗口中的图片。  According to another aspect of the invention, there is provided a page image rendering apparatus, comprising: a block divider configured to divide a page into a plurality of blocks; registrar blocks, configured to each block register, and each block needs to delay presentation of images to be registered; picture renderer is configured to download a page of pictures is not registered in the browser; render judgment block configured to determine registration whether the block to be presented, if you want to render, block by picture rendering in the browser to download registration required delay in registering the picture presented; as well as pictures renderer configured to render images downloaded by the renderer , located in the current browser window picture. 可选地，区块注册器将需要延时呈现的图片的地址信息嵌入到图片标签的自定义标签属性中。  Alternatively, the block registrar will need to delay the presentation of the picture address information is embedded into a custom tag image tag's attribute. 可选地，区块呈现判定器通过判断所注册的区块是否位于浏览器的当前窗口中来判断所注册的区块是否要呈现。  Alternatively, the block is determined by presenting block determines whether the registration block is located in the current browser window to determine whether the registration is to be presented. 可选地，区块呈现判定器通过判断所述注册的区块是否在浏览器的窗口中移动来判断是否要呈现所述注册的区块。  Alternatively, the block is determined by presenting the registration block determines whether the mobile browser window to determine whether the registration of the block to be presented. 可选地，当浏览器的当前窗口上呈现的内容发生变化时，区块呈现判定器判断注册的区块是否要呈现，如果要呈现，则由图片渲染器来下载注册的区块中需要延时呈现的注册的图片。  Alternatively, when the content presented on the current browser window changes, the block presents arbiter's judgment of whether the block to be presented, if presented by the picture renderer to download registration blocks need to delay registration of the images presented. 可选地，图片渲染器将图片的地址信息从图片标签的自定义标签属性复制到图片标签的源地址属性中，以便浏览器可以根据图片标签的内容去下载图片。  Alternatively, the picture renderer pictures of address information is copied from the custom label attribute of the image tag to the source address attribute of the image tag so that the browser can go to download the picture based on the content of the image tag. 根据本发明的在页面中的图片呈现方法和页面中的图片呈现设备，通过将页面划分为多个区块，区块中可以放置注册过的、需要延时呈现的图片，当区块位于页面的可见区域之内时，才会对该区块中注册过的、需要延时呈现的图片进行下载。  The rendered image of the page and the page according to the present invention a method of image rendering apparatus, by dividing the page into a plurality of blocks, blocks may be placed over the register, image presentation delay is needed, the district when within, will be registered with the block block the visible area of ​​the page, you need to delay rendered image to download. 如果该区块一直处于页面的不可见区域时，该区块内的图片将不会被下载，此时浏览器会把网络资源分配给下载需要呈现的图片，从而能够合理运用网络资源，提高页面的加载速度。 If the block has been in a non-visible area of ​​the page, the picture within the block will not be downloaded, then the browser will download the required network resources are allocated to the picture presented to enable rational use of network resources, improve page the loading speed. 图2示出了根据本发明一个实施例的用于浏览器的实例性的页面200;以及图3示出了根据本发明一个实施例的页面中的图片呈现设备300的结构框图。  FIG 2 illustrates an example of a page for the browser 200 according to an embodiment; and  FIG. 3 shows an embodiment of a page of the present invention the image rendering apparatus 300 Structure diagram. Web页面运行在各种各样的浏览器当中，浏览器下载、解析和渲染Web页面内容的速度直接影响着用户体验。  Web page to run in a wide variety of browsers which, browser download, parse and render Web page content directly affects the speed of the user experience. 为此，本发明提出一种页面中的图片呈现方法和一种页面中的图片呈现设备。 To this end, the invention proposes a page image rendering method and a page image rendering device. 为了方便说明，在下面的描述中，设浏览器窗口的平面为XY平面。 Plane for convenience of explanation, in the following description, it is assumed browser window XY plane. 本发明提出的在页面中的图片呈现方法是，将页面划分为多个区块，区块中可以放置注册过的、需要延时呈现的图片，当区块位于页面的可见区域之内时，才会对该区块中注册过的、需要延时呈现的图片进行下载。  The present invention is made in the page image rendering method, the page is divided into a plurality of blocks, blocks may be placed over the register, image presentation delay is needed, when the block is located in the visible region of the page when inside, will be registered with the block, delay is needed rendered image to download. 如果该区块一直处于页面的不可见区域时，该区块内的图片将不会被下载，此时浏览器会把网络资源分配用于下载需要呈现的图片，从而能够合理运用网络资源，有效提高页面的加载速度。 If the block has been in a non-visible area of ​​the page, the picture within the block will not be downloaded, then the browser will need to download the network resource allocation for rendering images, enabling the rational use of network resources, effective improve the loading speed of the page. 这里的"可见区域"是指网页的可视范围，具体是指整个HTML页面文档能够呈现在浏览器窗口的部分。 Here the "visible region" refers to the visible range of pages, specifically refers to the entire HTML page document can be presented in a part of the browser window. 通常一个HTML文档的整体高度都高于浏览器窗口的高度，所以会有一部分的页面处于隐藏的状态，用户可以通过移动浏览器的滚动条来查看页面的这些隐藏的区域，在整个过程中，能够看到的部分被称为页面的可见区域。 Usually a total height of an HTML document are higher than the height of the browser window, so there will be a page in a hidden part of the state, the user can view these hidden areas of the page by moving the scroll bar of the browser, throughout the process, be able to see part of the visible area of ​​the page is called. 下面结合图1具体说明根据本发明一个实施例的、适于解决上述问题的页面中的图片呈现方法1〇〇的流程图。  specifically below with reference to FIG. 1 presents a flow chart illustrating a method according to the page 1〇〇 of one embodiment of the present invention is suitable for solving the above problems in the pictures. 如图1所示，根据本发明一实施例的页面中的图片呈现方法100始于步骤S110,在步骤S110中，将页面划分为多个区块并注册。  1, a page according to the present embodiment of the invention, the image presentation method 100 begins with step S110, the in step S110, the page is divided into a plurality of blocks and registered. 其中，每个区块中可以放置一个或多个图片， 该图片可以是静态图片或动态图片。 Wherein, each block can be placed in one or more pictures, the picture may be a still picture or a dynamic picture. 通过对区块中的图片进行管理，可实现各图片不同的呈现方式，例如有的图片无需注册即可直接呈现，而有的图片需注册，然后再根据条件确定何时呈现。 By block to manage the picture, the picture may be implemented in different ways as, for example, some pictures can be presented directly without having to register, but registration is required and some pictures, and then when conditions are determined according to the presentation. 图2示出了根据本发明一个实施例的用于浏览器的实例性的页面200。  FIG. 2 shows an example of a page for a browser in accordance with an embodiment of the present invention 200. 如图2所示， 一个HTML文档所形成的页面200根据浏览器窗口210的高度在浏览器的Y轴方向上被划分成多个区块，为了图示清晰起见，图2中只示出了两个区块201和202,实际上可以包括若干个区块。 2, a page of HTML document 200 formed in accordance with the height of the browser window 210 is divided in the Y-axis direction into a plurality of blocks browser, for clarity of illustration, FIG. 2 shows only the two blocks 201 and 202, may actually comprise a number of blocks. 在呈现页面期间，可以记录划分出的多个区块，例如，可以在页面加载期间，利用在页面加载时运行的JS脚本来注册所划分的区块。 During the presentation page, you can record multiple blocks divided, for example, may be performed during page loads, the use of JS script to run when the page loads to register divided blocks. 在区块201中，包含三个图片2011、2012、和2013,其中图片2011为需要延时呈现的图片，而图片2012和2013为即时呈现的图片。 In block 201, includes three pictures 2011, 2012, and 2013, of which 2011 is the need to delay the picture presented pictures, and images 2012 and 2013 is presented in real-time picture. 在区块202中，包含三个图片2021、2022、和2023,其中图片2022和2023为需要延时呈现的图片，而图片2021为即时呈现的图片。 In block 202, it includes three pictures 2021, 2022, and 2023, 2022 and 2023 in which the images appear to require a delay of the picture, and the picture presented in 2021 as a real-time picture. 这里，需要延时呈现的图片只有在需要显示时，例如当其所在的区块位于浏览器的当前窗口中时或者浏览器的滚动条滚动时其所在的区块会处于浏览器的当前窗口时才会呈现。 When the current window here, need to delay presentation of pictures displayed only when needed, such as when they are in the block is located in the current browser window or the scroll bar to scroll it in the browser blocks will be in the browser It will be presented. 在图2中只示出了在Y轴方向有滚动条的例子，可选地，当页面在X轴方向上的宽度大于浏览器窗口的宽度（即浏览器窗口在X轴方向上的大小）时，在X轴方向上也可以划分出多个区块，划分方式如上面所述的在Y轴方向上的划分方式。  In FIG. 2 shows an example of a scroll bar in the Y-axis direction, alternatively, when the page width in the X-axis direction is larger than the width of the browser window (i.e., the browser window in the X-axis direction when the size) in the X-axis direction may be divided into a plurality of blocks, division manner as of the above division manner in the Y-axis direction. 随后，在步骤S120中，对页面中每个区块中的需要延时呈现的图片进行注册。  Subsequently, in step S120, a page in each block needs to delay presenting a picture to register. 也就是，如果该区块中有需要延时呈现的图片时，将该需要延时呈现的图片进行注册。 That is, if there is need for a delay in the block showing a picture, the picture presented by the delay required to register. 在本发明的实施例中，需要延时呈现的图片的图片标签(例如img标签）中没有图片的地址信息，例如没有"src=〃图片的地址〃"部分或者src中没有赋值，而是将需要延时呈现的图片的地址信息嵌入到图片标签的自定义标签属性中，例如该自定义标签属性可以是延迟加载属性(data-lazyload)。  In an embodiment of the present invention, the delay is needed rendered image picture tag (e.g., tag img) images without address information, for example, no "src = the 〃 〃 picture address" src or no assignment section, but it will require a delay rendered image address information into the custom image tag label attributes, for example the custom label attributes may be delayed load attribute (data-lazyload). 因此当页面在解析需要延时呈现的图片的图片标签时，由于需要延时呈现的图片的图片标签中没有关键的图片的地址信息，使得在该页面中不会立即呈现图片，而是会根据图片标签的自定义标签属性延迟呈现该图片。 So when the page when parsing the required delay rendered picture image tag, due to the need to delay presenting a picture of the image tag does not address the key picture information so that the picture does not appear immediately in the page, but will be based on custom label attribute of the image tag delayed presentation of the picture. 随后，在步骤S130中，在浏览器中下载该页面中未注册的图片。  Subsequently, in step S130, the download page is not registered images in the browser. 其中，下载该页面中未注册的图片的过程可以是页面先解析未注册的图片的图片标签，由于图片标签中有图片的地址信息时，浏览器可立即下载该图片。 Among them, the download page is not registered picture process can be resolved first page of unregistered picture image tag, due to the image tag address information of the picture, the browser can immediately download the picture. 例如，在图2所示的页面200中，未注册的图片2012、2013以及2021在显示页面200 时就可以直接被下载，也就是说，未注册的图片所在的区块即使未处于浏览器的当前窗口中，该图片也已被下载，并随时处于被呈现的状态。  For example, in FIG. 2 pages 200, 2012, 2013 and the unregistered image 2021 may be downloaded directly to the display page 200, that is, the block where the unregistered image is not even the current window of the browser, this picture has been downloaded and ready to be presented in the state. 随后，在步骤S140中，判断是否要呈现所注册的区块。  Subsequently, in step S140, it is determined whether a block registered to be presented. 可选地，可通过以下两种方式判断所注册的区块是否要呈现:方式一、判断该区块是否位于浏览器的当前窗口中。 A way to determine whether the block is located in the current browser window: Alternatively, if you want to block the registration of the judgment rendered in two ways. 方式二、判断该区块是否通过移动而位于浏览器的窗口中，例如区块在浏览器的Y轴方向上移动，或者区块在浏览器的X轴方向上移动。 Second way, the window is determined whether the block located in the mobile browser, for example, the block is moved in the Y-axis direction of the browser, or the block is moved in the X-axis direction browser. 其中，位于浏览器的当前窗口中的区块是指页面中在浏览器当前窗口中显示的区块。  wherein, in the browser's window of the current block refers to a block of a page displayed in the current browser window. 通常一个由HTML文档形成的页面的整体高度高于浏览器窗口的高度，所以一部分的页面会处于隐藏的状态，这可以通过移动浏览器的滚动条来达到查看处于隐藏状态的部分页面。 The whole page is typically formed from a HTML document height above the height of the browser window, so part of the page will be hidden state, which can reach parts of the page to see the hidden state by moving the scroll bar of the browser. 再参见图2,页面200的区块201位于浏览器的当前窗口210中，而区块202未处于浏览器的当前窗口210中，所以，区块201被判断为要呈现，而区块202被判断为不呈现。 2, page 200 of the block  Referring again to Figure 201 is located in the current browser window 210, the block 202 is not in the current browser window 210, so block 201 is determined to be present, and the district block 202 is determined to be not present. 可选地，如果区块202通过浏览器的滚动条可以呈现，那么区块202也被判断为要呈现。 Alternatively, if the block 202 may be rendered by the browser scroll bar, then block 202 is also judged to be rendered. 当在步骤S140中判断某个区块要呈现时，则进入步骤S150。  When a block is determined to be presented at step S140, the process proceeds to step S150. 在步骤S150中，在浏览器中解析、渲染并下载该区块中需要延时呈现的注册的图片。 In step S150, the browser parsing, rendering and download the required delay register block of the picture presented. 可选地，将图片的地址信息从图片标签的自定义标签属性复制到图片标签的源地址属性中，以便浏览器可以根据图片标签的内容去下载该图片。 Alternatively, the picture of address information is copied from the custom label attribute of the image tag to the source address attribute of the image tag so that the browser can go to download the picture according to the picture content label. 在步骤S150下载注册的区块中的需要延时呈现的注册的图片后，在步骤S160中， 呈现所下载的位于浏览器的当前窗口中的图片，这里的图片包括所下载的未注册的图片和下载的注册的图片。 After the  need to download the registration block in step S150 delay registration of images presented, in step S160, presenting the downloaded in the browser's current window of the picture, the picture here includes not downloaded registered picture registered images and download. 需要说明的是，图1所示的方法并不限定按所示的各步骤的顺序进行，可以根据需要调整各步骤的先后顺序，例如步骤S140~步骤S160,也可在步骤S130之前，另外，所述步骤也不限定于上述步骤划分，上述步骤可以进一步拆分成更多步骤也可以合并成更少步骤。  Incidentally, the method shown in FIG. 1 is not limited by the order of the steps performed shown, can adjust the sequence of steps, for example steps S140 ~ step S160, the step S130 may be prior to in addition, the step of dividing is not limited to the above step, the above steps may be further divided into more steps may be combined into fewer steps. 下面结合图3说明根据本发明一个实施例的、适于解决上述问题的一种页面中的图片呈现设备300。  described below in connection with FIG. 3 presents a page apparatus 300 according to an embodiment of the present invention, is adapted to solve the above problems in the image. 如图3所示，本发明实施例的页面中的图片呈现设备300包括：区块划分器310、区块注册器320、图片渲染器340、区块呈现判定器330和图片呈现器350。  As shown in Figure 3, the embodiment of the present invention, the page image rendering apparatus 300 comprises: a block divider 310, a block register 320, image renderer 340, rendering block 330 and determines image renderer 350. 其中，区块划分器310被配置为将页面划分为多个区块。  wherein, the block 310 is configured to divide a page into a plurality of blocks. 可选地，区块划分器310被配置为在浏览器窗口的高度方向上将页面划分为多个区块，其中，每个区块中可以放置一个或多个图片，该图片可以是静态图片或动态图片。 Alternatively, the block divider 310 is configured to divide a page in a browser window on a height direction for a plurality of blocks, wherein each block can be placed in one or more pictures, the picture may be a still image or motion pictures. 通过对区块中的图片进行管理，实现各图片不同的呈现方式，例如有的图片无需注册即可直接呈现，而有的图片需注册，然后再根据条件确定何时呈现。 Through the block of picture management, each picture showing a different way, for example, some pictures can be presented directly without having to register, but registration is required and some pictures, and then determine when to present depending on the conditions. 可选地，可在浏览器窗口的高度方向（即浏览器窗口的Y轴方向）上将页面划分为多个区块(block)。 Alternatively, in the height direction on the browser window (i.e., the Y-axis direction of the browser window) page is divided into a plurality of blocks (block). 例如，如图2所示，一个HTML文档所形成的页面200根据浏览器窗口210的高度在浏览器的Y轴方向上被划分成多个区块，为了图示清晰起见，图2中只示出了两个区块201和202,实际上可以包括若干个区块。 For example, as shown in FIG. 2, a page of HTML document 200 formed in accordance with the height of the browser window 210 is divided in the Y-axis direction into a plurality of blocks browser, for clarity of illustration, shown in FIG. 2 the two blocks 201 and 202, may actually comprise a number of blocks. 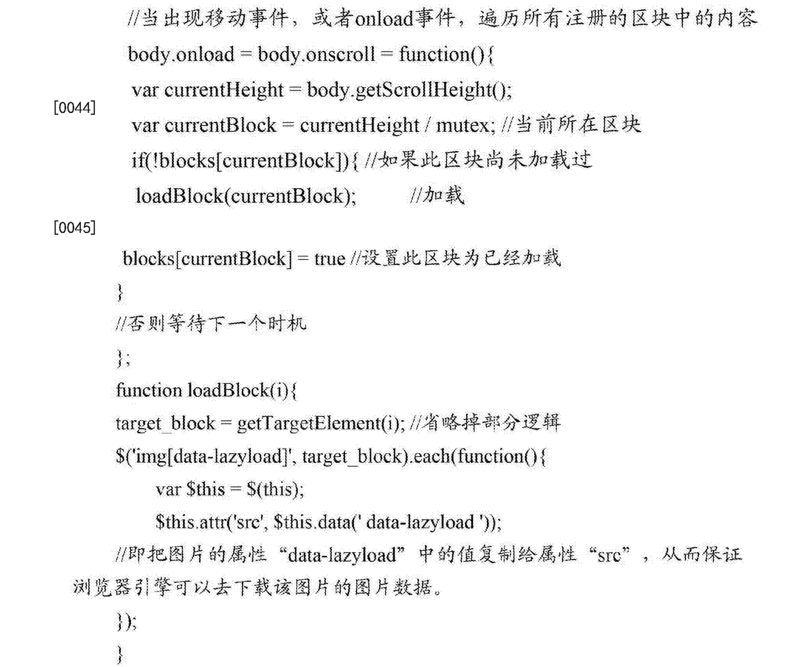 在呈现页面期间，可以记录划分出的多个区块。 During the presentation page, you can record multiple blocks demarcated. 例如，可以在页面加载期间，利用在页面加载时运行的JS脚本来注册所划分的区块。 For example, during the page load, use of JS script to run when the page loads to register divided blocks. 在区块201中，包含三个图片2011、2012、和2013,其中图片2011为需要延时呈现的图片， 而图片2012和2013为即时呈现的图片。 In block 201, includes three pictures 2011, 2012, and 2013, of which 2011 is the need to delay the picture presented pictures, and images 2012 and 2013 is presented in real-time picture. 在区块202中，包含三个图片2021、2022、和2023,其中图片2022和2023为需要延时呈现的图片，而图片2021为即时呈现的图片。 In block 202, it includes three pictures 2021, 2022, and 2023, 2022 and 2023 in which the images appear to require a delay of the picture, and the picture presented in 2021 as a real-time picture. 区块注册器320对区块划分器310所划分出的各区块进行注册，并对各区块中需要延时呈现的图片进行注册。  Block 320 registered for each block of the block divider 310 divided to register, and each block needs to delay presenting a picture to register. 例如，对于图2所示的页面200,其中需要延时呈现的图片2011、 2022和2023要进行注册。 For example, for the page shown in Figure 2200, which requires a delay rendered images 2011, 2022 and 2023 to be registered. 在上述代码中，需要延时呈现的图片的图片标签img中没有图片的地址信息（即， 没有" SrC=〃图片的地址〃"部分），而是将需要延时呈现的图片的地址信息嵌入到图片标签img的自定义标签属性中，例如该自定义标签属性可以是延迟加载属性(data-lazyload)。 No address information of images  In the above code, the required delay rendered image img image tag (i.e., no "SrC = 〃 〃 picture address" section), but would require a delay of the rendered image address information is embedded custom label tag img picture attributes, such as the custom label attributes may be delayed load attribute (data-lazyload). 因此，当页面在解析需要延时呈现的图片的图片标签img时，由于需要延时呈现的图片的图片标签img中没有关键的图片的地址信息，使得在该页面中不会立即呈现图片，而是会根据图片标签的自定义标签属性延迟呈现该图片。 Therefore, when the page when parsing the required delay rendered image tag img pictures, due to the need to delay the presentation of the picture image tag img No address information critical of the picture, so as not to immediately render pictures on this page, and the picture will appear delayed according to custom label attribute of image tag. 区块呈现判定器330被配置为判断是否要呈现所注册的区块。  Block 330 presents determining is configured to determine whether to render the block being registered. 可选地，区块呈现判定器330通过判断所注册的区块是否位于浏览器的当前窗口中来判断是否要呈现;或者，区块呈现判定器330通过判断注册的区块在浏览器窗口的滚动条移动时是否可见来判断是否要呈现。 Alternatively, the block 330 is determined by the presentation determining whether the registered block in the browser's to determine whether the current window is to be presented; Alternatively, the block 330 determines that presented in the browser window is determined by the registration block when moving the scroll bar is visible to determine whether to present. 其中，位于浏览器的当前窗口中的区块是指页面中在浏览当前窗口中显示的区块。  wherein, in the browser's window of the current block refers to a block of a page displayed in the current browser window. 通常一个HTML文档形成的页面的整体高度高于浏览器窗口的高度，所以只有一部分的页面会在浏览当前窗口中显示，其它的部分将处于不可见区域，即处于隐藏的状态，而处于不可见区域的部分可以通过移动浏览器的滚动条来查看。 The whole page is typically an HTML document form height higher than the height of the browser window, so that only a portion of the current page will be displayed in the browser window, the other part will be in the invisible region that is hidden in the state, but in the invisible part of the area can be viewed by moving the scroll bar of the browser. 如图2所示的页面200,区块201位于浏览器的当前窗口210中，而区块202未处于浏览器的当前窗口210中，所以，区块201被判断为要呈现，而区块202被判断为不呈现。 Page shown in  FIG. 2200, block 201 is located in the current browser window 210, the block 202 is not in the current browser window 210, so block 201 is determined to be rendered, and block 202 is determined to be not present. 可选地，如果区块202通过浏览器的滚动条可以呈现，那么区块202也被判断为要呈现。 Alternatively, if the block 202 may be rendered by the browser scroll bar, then block 202 is also judged to be rendered. 图片渲染器340被配置为在浏览器中下载该页面中未注册的图片，以及在浏览器中下载区块呈现判定器330判定呈现的区块中需要延时呈现的注册的图片。  Image renderer 340 is configured to download the page picture is not registered in the browser, download and render judgment block 330 determines that the block presented a delay registration required picture rendered in the browser. 其中，对于页面中未注册的图片，在浏览器中直接解析、渲染、并下载，然后进行呈现，具体过程可参照步骤S130的描述;而对于区块呈现判定器330判定呈现的区块中需要延时呈现的注册的图片，在浏览器中并不能直接下载而呈现，因为在需要延时呈现的图片的图片标签img中没有图片的地址信息或者src中没有赋值，这时，图片渲染器340可以将需要延时呈现的注册的图片的地址信息从图片标签的自定义标签属性复制到图片标签的源地址属性中，以便浏览器可以根据图片标签的地址信息去下载该图片。 Wherein, for the page image is not registered directly in the browser parsing, rendering, and downloading and rendering, the specific process may be described with reference to step S130; and for the determination block 330 determines that render block needs presented registration delay rendered images in the browser and can not be directly downloaded and rendered, because the address information, or no picture src require a delay in the presentation of images in the image tag img no assignment, then, the picture renderer 340 You may need to delay the registration of the images presented address information is copied from the custom label attribute of the image tag to the source address attribute of the image tag so that the browser can go to download the pictures from the address information pictures label. 这里，页面的解析、渲染和下载可以是浏览器将图片根据HTML规范定义的规则而准备要显示在浏览器窗口中的页面内容的过程。 Here, page parsing, rendering, and the browser will download pictures can be according to the rules defined in the HTML specification preparation and content of the page in the browser window to be displayed. 可选地，当浏览器的当前窗口上呈现的内容发生变化时，区块呈现判定器330判断上述注册的区块是否要呈现，如果要呈现，则由图片渲染器340来下载该注册的区块中需要延时呈现的注册的图片。  Alternatively, when the content presented on the current browser window changes, showing determination block 330 determines whether or not to block such registration is presented, if presented by the picture to download the renderer 340 block registration required delay in registering the picture presented. 图片呈现器350被配置为呈现由图片渲染器340所下载的、位于浏览器的当前窗口中的图片，这里的图片包括所下载的未注册的图片和下载的注册的图片。  Image renderer 350 is configured to present a picture downloaded renderer 340, located in the current browser window in the picture, a picture registered picture here includes unregistered downloaded images and download. 根据本发明的设备，其中当浏览器的当前窗口上呈现的内容发生变化时，所述区块呈现判定器判断所述注册的区块是否要呈现，如果要呈现，则由所述图片渲染器来下载所述注册的区块中需要延时呈现的注册的图片。  When the apparatus according to the present invention, wherein the content rendered on the browser when the current window is changed, the block presenting said registration determiner determines whether the block is to be presented, if present, by the picture renderer to download the registration of blocks required delay registration of images presented. 根据本发明的设备，其中所述图片渲染器将图片的地址信息从所述图片标签的自定义标签属性复制到图片标签的源地址属性中，以便浏览器可以根据图片标签的内容去下载所述图片。 , wherein said address information renderer picture image copying apparatus according to the invention from the custom label attribute of the image tag to the source tag address attribute image, so that the browser can go to the contents of the image tag Download the picture. 本领域那些技术人员可以理解，可以对实施例中的设备中的模块进行自适应性地改变并且把它们设置在与该实施例不同的一个或多个设备中。  Those skilled in the art can appreciate that embodiments of the device modules adaptively changed and set them in one or more devices different from this embodiment of the. 可以把实施例中的模块或单元或组件组合成一个模块或单元或组件，以及此外可以把它们分成多个子模块或子单元或子组件。 The embodiments may be modules or units into one module or component or components or units, and in addition they can be divided into a plurality of sub-modules or sub-units or sub-assemblies. 除了这样的特征和/或过程或者单元中的至少一些是相互排斥之外，可以采用任何组合对本说明书(包括伴随的权利要求、摘要和附图）中公开的所有特征以及如此公开的任何方法或者设备的所有过程或单元进行组合。 Any method other than such features and / or process, or at least some of the units are mutually exclusive, any combination of the present specification (including the accompanying claims, abstract and drawings) All of the features disclosed in, or disclosed herein and such All process units or equipment combination. 除非另外明确陈述，本说明书(包括伴随的权利要求、摘要和附图）中公开的每个特征可以由提供相同、等同或相似目的的替代特征来代替。 Unless expressly stated otherwise, each feature of the present specification (including the accompanying claims, abstract and drawings) may be provided by the same disclosed, characterized equivalents or similar purpose may be substituted. 本发明的各个部件实施例可以以硬件实现，或者以在一个或者多个处理器上运行的软件模块实现，或者以它们的组合实现。 Example  The various components of the present invention may be implemented in hardware, or as software modules running on one or more processors, or in a combination thereof. 本领域的技术人员应当理解，可以在实践中使用微处理器或者数字信号处理器① SP)来实现根据本发明实施例的页面中的图片呈现设备中的一些或者全部部件的一些或者全部功能。 Those skilled in the art should appreciate that a microprocessor or digital signal processor used in practice ① SP) to present some or all functions implemented in the device in accordance with some or all members of the present embodiment of the invention, a page of pictures. 本发明还可以实现为用于执行这里所描述的方法的一部分或者全部的设备或者装置程序(例如，计算机程序和计算机程序产品）。 The present invention may also be implemented as a part or all of the device or apparatus programs for performing the methods described herein (e.g., computer programs and computer program products). 这样的实现本发明的程序可以存储在计算机可读介质上，或者可以具有一个或者多个信号的形式。 Such a program implementing the present invention may be stored on a computer-readable medium, or may have the form of one or more signals. 这样的信号可以从因特网网站上下载得到，或者在载体信号上提供，或者以任何其他形式提供。 Such signals can be downloaded from the Internet website, or provided on a carrier signal, or in any other form. 应该注意的是上述实施例对本发明进行说明而不是对本发明进行限制，并且本领域技术人员在不脱离所附权利要求的范围的情况下可设计出替换实施例。  It should be noted that the embodiments of the present invention, the above-described embodiments illustrate rather than limit the invention, and those skilled in the art without departing from the scope of the appended claims may be devised alternative embodiments. 在权利要求中， 不应将位于括号之间的任何参考符号构造成对权利要求的限制。 In the claims, should not be limited by any reference signs located claimed configured to claims between parentheses. 单词"包含"不排除存在未列在权利要求中的元件或步骤。 The word "comprising" does not exclude the presence of elements or steps not listed in the appended claims. 位于元件之前的单词"一"或"一个"不排除存在多个这样的元件。 Preceding an element of the word "a" or "an" does not exclude the presence of a plurality of such elements. 本发明可以借助于包括有若干不同元件的硬件以及借助于适当编程的计算机来实现。 The present invention by means of hardware comprising several distinct elements, and by means of a suitably programmed computer implemented. 在列举了若干装置的单元权利要求中，这些装置中的多个可以是通过同一个硬件项来具体体现。 Unit claims enumerating several means, a plurality of these means may be embodied by the same item of hardware. 单词第一、第二、以及第三等的使用不表示任何顺序。 Word of the first, second, and third, etc. does not denote any order. 可将这些单词解释为名称。 These words can be interpreted as names. 1. 一种页面中的图片呈现方法，包括步骤： 将页面划分为多个区块并注册;其中，所述将页面划分为多个区块的步骤具体包括:将所述页面在浏览器窗口的高度方向上划分为多个区块，和/或，将所述页面在浏览器窗口的宽度方向上划分为多个区块； 对各区块中需要延时呈现的图片进行注册； 在浏览器中下载所述页面中未注册的图片； 判断所述注册的区块是否要呈现，如果要呈现，则在浏览器中下载所述注册的区块中需要延时呈现的注册的图片；以及呈现所下载的位于浏览器的当前窗口中的图片； 其中，所述判断所述注册的区块是否要呈现的步骤包括:判断所述注册的区块是否位于浏览器的当前窗口中；或者，所述判断所述注册的区块是否需要呈现的步骤包括:判断所述注册的区块在浏览器窗口的滚动条移动时是否可见。 A page image presentation method, comprising the steps of: a page is divided into a plurality of blocks and registered; wherein said page is divided into a plurality of blocks comprises the step of: the page in a browser window divided in the height direction into a plurality of blocks, and / or, the page is divided into a plurality of blocks in the width direction of the browser window; registration delay is needed for each block of the present picture; browser the download page is not registered images; determining whether to block the registration of the presentation, if you want to appear, the download block the registration of the delay registered in need of images rendered in the browser; and rendering downloaded to a browser in the current window image; wherein the step of determining whether the registration is to be rendered block comprising: determining whether the registered block in the current browser window; or, as said step of determining whether the registration blocks need to be rendered comprises: determining whether the registered block is visible when the window scroll bar moves. 2. 根据权利要求1所述的方法，其中对各区块中需要延时呈现的图片进行注册的步骤包括： 将需要延时呈现的图片的地址信息嵌入到图片标签的自定义标签属性中。 Step 2. The method according to claim 1, wherein each delay block need to register rendered image comprising: a delay is needed rendered image of the address information is embedded in image custom label tag attributes. 3. 根据权利要求1或2所述的方法，还包括步骤， 当浏览器的当前窗口中呈现的内容发生变化时，判断所述注册的区块是否要呈现，如果要呈现，则下载所述注册的区块中需要延时呈现的注册的图片。 3. The method of claim 1 or claim 2, further comprising the step of, when the content of the current browser window presenting changed, determining whether the registered block is to be presented, if to be rendered, then the download block registration required delay in registering the picture presented. 4. 如权利要求1或2所述的方法，其中下载所述注册的区块中需要延时呈现的注册图片包括步骤： 将图片的地址信息从所述图片标签的自定义标签属性复制到图片标签的源地址属性中，以便浏览器可以根据图片标签的内容去下载所述图片。 4. The method of claim 1 or claim 2, wherein the block downloading the required registration of the delay register image rendering comprises the steps of: copying the image of the address information from the custom label attribute tag to the picture image source address attribute tag so that the browser can download the picture image according to the content of the tag. 5. 如权利要求3所述的方法，其中下载所述注册的区块中需要延时呈现的注册图片包括步骤： 将图片的地址信息从所述图片标签的自定义标签属性复制到图片标签的源地址属性中，以便浏览器可以根据图片标签的内容去下载所述图片。 5. The method according to claim 3, wherein the block downloading the required registration of the delay register image rendering comprises the steps of: copying the image of the address information from the custom label attribute tag to the picture image label source address attribute, so that the browser can download the picture image according to the content of the tag. 6. -种页面中的图片呈现设备，包括： 区块划分器，被配置为将页面划分为多个区块;其中，所述区块划分器具体用于:将所述页面在浏览器窗口的高度方向上划分为多个区块，和/或，将所述页面在浏览器窗口的宽度方向上划分为多个区块； 区块注册器，被配置为对各区块进行注册，并对各区块中需要延时呈现的图片进行注ΠΠ. 册； 图片渲染器，被配置为在浏览器中下载所述页面中未注册的图片； 区块呈现判定器，被配置为判断所述注册的区块是否要呈现，如果要呈现，则由所述图片渲染器在浏览器中下载所述注册的区块中需要延时呈现的注册的图片；以及图片呈现器，被配置为呈现由图片渲染器所下载的、位于浏览器的当前窗口中的图片； 其中所述区块呈现判定器通过判断所注册的区块是否位于浏览器的当前窗口中来判断所注册的区块是否要呈 6. - species page image rendering apparatus, comprising: a block divider configured to divide a page into a plurality of blocks; wherein said particular divider block is used: the page in a browser window divided in the height direction into a plurality of blocks, and / or, the page is divided into a plurality of blocks in the width direction of the browser window; registration block configured to register to the respective blocks, and each block requires a delay rendered picture Note ΠΠ book; Image renderer is configured to download the page in a browser is not registered in the picture; render judgment block configured to determine whether the registration of whether the block to be presented, if you want to render the picture by the renderer download block the registration of the delay registered in need of images rendered in the browser; as well as pictures renderer configured to render the picture presented is downloaded, the current browser window located in the image; wherein said block presents the block is determined by judging whether the registered block is located in the current browser window to determine whether or not to register the form ;或者，所述区块呈现判定器通过判断所述注册的区块在浏览器窗口的滚动条移动时是否可见来判断是否要呈现所述注册的区块。 ; Or by the determination block determines whether the present block registered in the scroll bar of the browser window is visible to the mobile determines whether the registered block is to be presented. 7. 如权利要求6所述的设备，其中所述区块注册器将需要延时呈现的图片的地址信息嵌入到图片标签的自定义标签属性中。 7. The apparatus according to claim 6, wherein said block address register will need to delay presentation of information embedded in the image of the label image custom label attribute. 8. 根据权利要求6或7所述的设备，其中当浏览器的当前窗口上呈现的内容发生变化时，所述区块呈现判定器判断所述注册的区块是否要呈现，如果要呈现，则由所述图片渲染器来下载所述注册的区块中需要延时呈现的注册的图片。 8. The apparatus according to claim 6 or claim 7, wherein when the content rendered on the browser when the current window is changed, the block presenting said registration determiner determines whether the block is to be presented, if present, the picture by the renderer to download the registration of blocks required delay registration of images presented. 9. 根据权利要求6或7所述的设备，其中所述图片渲染器将图片的地址信息从所述图片标签的自定义标签属性复制到图片标签的源地址属性中，以便浏览器可以根据图片标签的内容去下载所述图片。 9. The apparatus according to claim 6 or claim 7, wherein the picture image renderer copy address information from the custom label attribute of the image tag to the source tag address attribute image, so that according to the picture browser content tab to download the picture. 10. 根据权利要求8所述的设备，其中所述图片渲染器将图片的地址信息从所述图片标签的自定义标签属性复制到图片标签的源地址属性中，以便浏览器可以根据图片标签的内容去下载所述图片。 10. The apparatus according to claim 8, wherein the picture image renderer copy address information from the custom label attribute of the image tag to the source tag address attribute image, so that the browser can image label in accordance with content to download the picture.